For two centuries, the arts thrived in Florence like never before. Under the patronage of the powerful Medici family, in the 1400s and 1500s, this was the centre of the Western world. The legacy of that period is unrivalled anywhere on the planet, and is preserved on the walls of the Uffizi, in the corridors of the Palazzo Vecchio, on the domed roof of the Duomo, and in churches like Santa Croce and Santa Maria Novella. Away from the art, the living here is good, too. The Chianti hills are on the doorstep, so a steady stream of fine wine flows through the city gates. In a short guide like this, it’s impossible to do more than merely scratch the surface of the city. 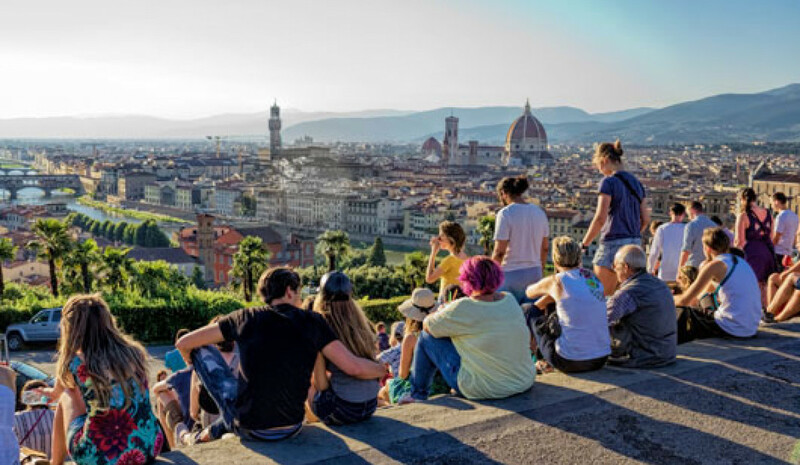 We suggest a good guidebook like “Frommer’s Easy Guide to Rome, Florence & Venice”, or a themed walk with Context Travel if you want to linger longer or dig a bit deeper (and if you can, you really should). Florence practically invented the Renaissance. Not only in art and architecture, either. Dante and Boccaccio were the first to write for the masses in what’s now the Italian language. Macchiavelli’s philosophy of ruthless “Realpolitik” was hugely influential in the conduct of statesmanship for centuries (and perhaps still is). But it is Florence’s painters, sculptors and architects that still draw millions every year. The Galleria degli Uffizi houses the world’s best collection of Renaissance painting: Giotto, Raphael, Michelangelo, Botticelli, Leonardo da Vinci, and many, many others are all here. The place is very popular, and rightly so. The city’s most famous artwork isn’t in the Uffizi, however. Michelangelo’s David — aka “Il Gigante” —originally stood outside the Palazzo Vecchio. In 1872 the statue was moved, on a specially designed trolley-tram, to a room at the Galleria dell’Accademia that was designed purely to show him off. Baccio Bandinelli's Hercules, Bartolomeo Ammanati's Neptune, and Giambologna's Equestrian Statue of Cosimo I. Under the Loggia dei Lanzi, copies of Roman statues are joined by Mannerist originals, including Cellini's bronze, Perseus Holding the Head of Medusa (1545). The city's octagonal Battistero (Baptistery) has more ancient roots. No one is sure exactly when it was built, but definitely before the 8th century. Lorenzo Ghiberti's Gates of Paradise — its bronze east doors, facing the cathedral — show scenes from the Old Testament, cast in low-relief. They took a couple of decades to make, and were unveiled in 1452. The restored originals are exhibited at the Museo dell’Opera del Duomo, which opened in vastly expanded premises in 2016. Almost equally significant in art history is Santa Maria Novella. Its polychrome façade fuses Romanesque styling — begun when the church was built from 1246 — with geometrical Renaissance classicism in the upper orders, added harmoniously by L. B. Alberti in the 1460s. Inside, Masaccio’s Trinity was the first painting to realistically depict linear perspective on a flat surface. When it was unveiled in 1428, amazed Florentines were convinced Masaccio had punched a hole in the wall, such was the realism. Across town, the nave at Santa Croce is lined with monumental tombs of famous Florentines, including Michelangelo (he died in Rome but his body was smuggled back home); Macchiavelli; and Dante (not a tomb, as he died in exile, in Ravenna). Two transept chapels were frescoed by Giotto di Bondone, an early 14th-century painter sometimes called the “Father of the Renaissance”. You might even recognize the Peruzzi Chapel from “A Room with a View”. Florentine flavours are bold and straightforward, and the city’s trademark cooking style is typically no-nonsense. 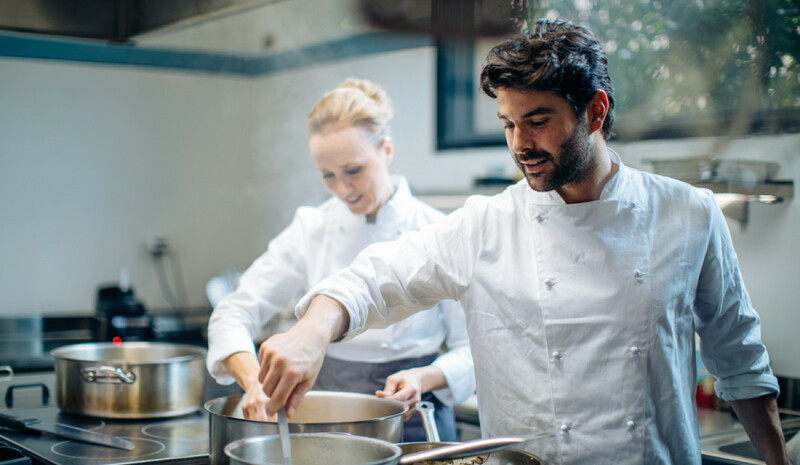 However, alongside the spezzatino (veal stew), roast meats, and trippa alla fiorentina (tripe cooked with tomatoes), a new generation of chefs offer a lighter interpretation of Florentine cooking. Florence also fights it out with Sicily for the claim to have invented gelato, an ice-cream-like dessert made with fresh milk. What indisputable is that the city’s gelaterie are some of the best in Italy. On a knoll at the farthest southern reaches of suburban Florence stands the Certosa del Galluzzo. Founded in 1342, the vast monastery has been expanded and altered over the centuries, and is best known for frescoes by Mannerist painter Pontormo (1522). 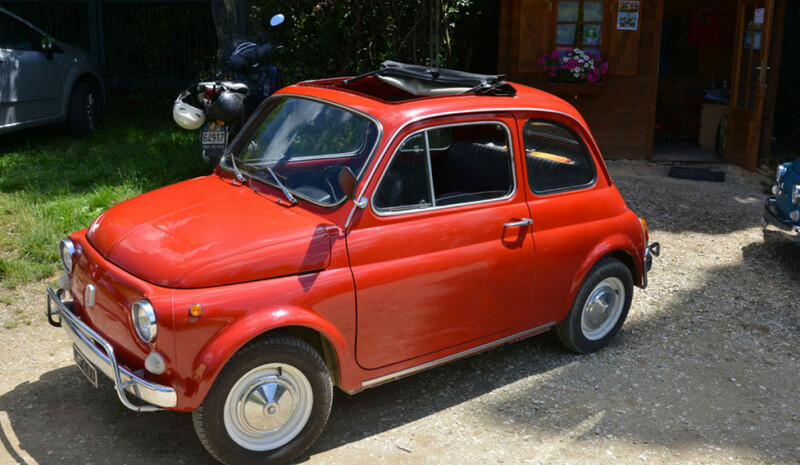 Prato, 15 miles north-west of Florence, is Tuscany’s second city and a major producer of leather and textiles. It has long links with Wenzhou, in China: Italy’s third-largest Chinese community, after Milan and Rome, calls it home. Its main art treasure is inside the Duomo. The city’s cathedral is dedicated to St. Stephen, the first Christian martyr. The striped façade has a curious circular pulpit (1438) bolted onto the front, a joint venture between architect Michelozzo and sculptor Donatello. What’s there right now is a copy; the original is next door, in the part of the Bishop’s palace that’s now Prato’s Museo dell’Opera del Duomo. Inside the cathedral, the apse chapel was completed in 1465 by Filippo Lippi and his assistants. His Scenes from the Life of St. John the Baptist incorporates Prato’s most famous image, of Salome dancing for King Herod. Prato is also the home of the biscotti di Prato — “Pratese biscuits”, made from almond flour, and more commonly called cantuccini. Wrapped in their royal blue packaging, they make a great gift. You will find one of Italy’s grandest gardens within Florence’s city limits. Behind the Palazzo Pitti, the Giardino di Boboli is laid out in the formal Renaissance style, with ordered walkways and carefully planned views of the palace and skyline, with hidden corners like the Isolotto (including dancing fountains) and the Hemicycle, a faux-Roman garden. After Milan, Florence is Italy’s best shopping city. Like its northern neighbour and rival, fashion is big business. The main haute couture drag is Via de’ Tornabuoni. 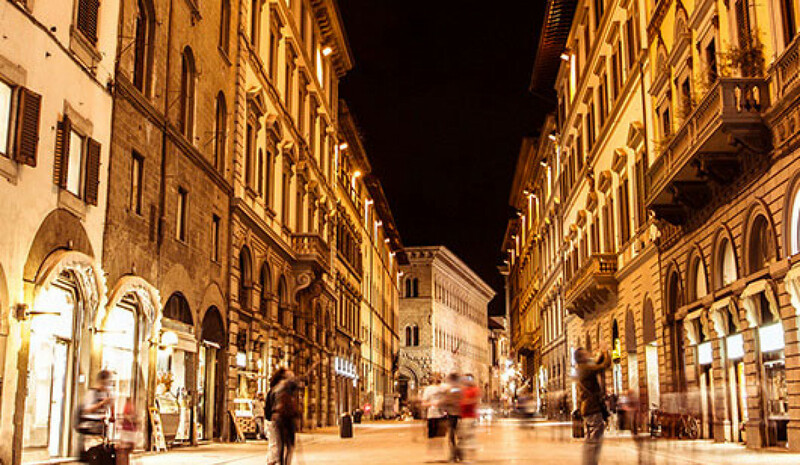 Along here, and in side-streets like Via della Vigna Nuova, you’ll find major names in Florentine fashion (Gucci, Pucci, Ferragamo) as well as Milanese and world designer labels like Prada and Armani. Just north of the Duomo, Via dei Servi retains the vibe of old Florence and the era before mass tourism. There you can window-browse independent booksellers, a philately store, traditional stationer’s, and more. Borgo degli Albizi, in the eastern part of the centre, has a younger feel to its fashions, with vintage shops, too. There has been a “pharmacy” on the site of the Officina Profumo-Farmaceutica di Santa Maria Novella since it was founded by Dominican friars in the 1600s. The present incarnation sells top-end fragrances and skincare for everyone (even the family pet). And if you don’t love what’s in stock, you can design your own fragrances. Florence also has a rep for leather. Everything at the Scuola del Cuoio is made on the premises by students at the city’s most prestigious leather-making school. Turn up during school hours (weekdays only) and you can watch trainee artisans at work. The city also has several markets. The much-photographed Mercato di San Lorenzo is stuffed with souvenirs; the Mercato Centrale is Florence’s covered food market, selling everything from salami and cheeses to Chianti wine. The upper floor is Italian street food heaven.